DEPOSITS – We will give only provisional credit until collection is final for any items, other than cash, we accept for deposit (including items drawn “on us”). Before settlement of any item becomes final, we act only as your agent, regardless of the form of endorsement or lack of endorsement on the item and even though we provide you provisional credit for the item. We may reverse any provisional credit for items that are lost, stolen, or returned. Actual credit for deposits of, or payable in, foreign currency will be at the exchange rate in effect on final collection in U.S. dollars. We are not responsible for transactions by mail or outside depository until we actually record them. We will treat and record all transactions received after our “daily cutoff time” on a business day we are open, or received on a day we are not open for business, as if initiated on the next business day that we are open. At our option, we may take an item for collection rather than for deposit. If we accept a third-party check for deposit, we may require any third-party endorsers to verify or guarantee their endorsements, or endorse in our presence. OWNERSHIP OF ACCOUNT AND BENEFICIARY DESIGNATION – These rules apply to this account depending on the form of ownership and beneficiary designation, if any, specified on the account records. We reserve the right to refuse some forms of ownership on any or all of our accounts. We make no representations as to the appropriateness or effect of the ownership and beneficiary designations, except as they determine to whom we pay the account funds. As used in this agreement “party” means a person who, by the terms of the account, has a present right, subject to request, to payment from a multiple-party account other than as an agent. Joint Account – This account or certificate is owned by the named parties. Upon the death of any of them, ownership passes to the survivor(s). Joint Account of Husband and Wife with Right of Survivorship – This account or certificate is owned by the named parties, who are husband and wife, and is presumed to be their community property. Upon the death of either of them, ownership passes to the survivor. Community Property Account of Husband and Wife – This account or certificate is the community property of the named parties who are husband and wife. The ownership during lifetime and after the death of a spouse is determined by the law applicable to community property generally and may be affected by a will. Tenancy in Common Account – This account or certificate is owned by the named parties as tenants in common. Upon the death of any party, the ownership interest of that party passes to the named pay-on-death payee(s) of that party or, if none, to the estate of that party. P.O.D. Account with Single Party – This account or certificate is owned by the named party. Upon the death of that party, ownership passes to the named pay-on-death payee(s). P.O.D. Account with Multiple Parties – This account or certificate is owned by the named parties. Upon the death of any of them, ownership passes to the survivor(s). Upon the death of all of them, ownership passes to the named pay-on-death payee(s). Totten Trust Account – (subject to this form) – If two or more of you create this account, you own the account jointly with survivorship. Beneficiaries cannot withdraw unless: (1) all persons creating the account die, and (2) the beneficiary is then living. If two or more beneficiaries are named and survive the death of all persons creating the account, such beneficiaries will own this account in equal shares, without right of survivorship. The person(s) creating either of these account types reserves the right to: (1) change beneficiaries, (2) change account types, and (3) withdraw all or part of the account funds at any time. Trust Account Subject to Separate Agreement – We will abide by the terms of any separate agreement which clearly pertains to this account and which you file with us. Any additional consistent terms stated on this form will also apply. AMENDMENTS AND TERMINATION – We may change our bylaws and any term of this agreement. Rules governing changes in rates are provided separately in the Truth-in-Savings disclosure or in another document. For other changes we will give you reasonable notice in writing or by any other method permitted by law. We may close this account if your membership in the credit union terminates, or by giving reasonable notice to you and tender of the account balance personally or by mail. Items presented for payment after the account is closed may be dishonored. When you close your account, you are responsible for leaving enough money in the account to cover any outstanding items and charges to be paid from the account. Reasonable notice depends on the circumstances, and in some cases such as when we cannot verify your identity or we suspect fraud, it might be reasonable for us to give you notice after the change or account closure becomes effective. For instance, if we suspect fraudulent activity with respect to your account, we might immediately freeze or close your account and then give you notice. At our option, we may suspend your rights to member services if you violate the terms of this agreement. You must keep us informed of your current address at all times. Notice from us to any one of you is notice to all of you. If we have notified you of a change in any term of your account and you continue to have your account after the effective date of the change, you have agreed to the new term(s). STATEMENTS – Your duty to report unauthorized signatures, alterations and forgeries – You must examine your statement of account with “reasonable promptness.” If you discover (or reasonably should have discovered) any unauthorized signatures or alterations, you must promptly notify us of the relevant facts. As between you and us, if you fail to do either of these duties, you will have to either share the loss with us, or bear the loss entirely yourself (depending on whether we used ordinary care and, if not, whether we contributed to the loss). The loss could be not only with respect to items on the statement but other items with unauthorized signatures or alterations by the same wrongdoer. Your duty to report other errors – In addition to your duty to review your statements for unauthorized signatures, alterations and forgeries, you agree to examine your statement with reasonable promptness for any other error – such as an encoding error. You agree that the time you have to examine your statement and report to us will depend on the circumstances. However, such time period shall not exceed 60 days. Failure to examine your statement and report any such errors to us within 60 days of when we first send or make the statement available precludes you from asserting a claim against us for any such errors on items identified in that statement and as between you and us the loss will be entirely yours. TEMPORARY ACCOUNT AGREEMENT – If this option is selected, this is a temporary account agreement. Each person who signs to open the account or has authority to make withdrawals (except as indicated to the contrary) may transact business on this account. However, we may at some time in the future restrict or prohibit further use of this account if you fail to comply with the requirements we have imposed within a reasonable time. RIGHT TO REPAYMENT OF INDEBTEDNESS – You each agree that we may (without prior notice and when permitted by law) charge against and deduct from this account any due and payable debt owed to us now or in the future, by any of you having the right of withdrawal, to the extent of such persons’ or legal entity’s right to withdraw. If the debt arises from a note, “any due and payable debt” includes the total amount of which we are entitled to demand payment under the terms of the note at the time we charge the account, including any balance the due date for which we properly accelerate under the note. Neither our contract rights nor rights under a statutory lien apply to this account if prohibited by law. For example, neither our contract rights nor rights under a statutory lien apply to this account if: (a) it is an Individual Retirement Account or similar tax-deferred account, or (b) the debt is created by a consumer credit transaction under a credit card plan (but this does not affect our rights under any consensual security interest), or (c) the debtor’s right of withdrawal arises only in a representative capacity. We will not be liable for the dishonor of any check or draft when the dishonor occurs because we charge and deduct an amount you owe us from your account. You agree to hold us harmless from any claim arising as a result of our exercise of our right to repayment. RESTRICTIVE LEGENDS – The automated processing of the large volume of checks we receive prevents us from inspecting or looking for special instructions or “restrictive legends” on every check. Examples of restrictive legends placed on checks are “must be presented within 90 days” or “not valid for more than $1,000.00.” For this reason, we are not required to honor any restrictive legend placed on checks you write unless we have agreed in writing to the restriction. We are not responsible for any losses, claims, damages, or expenses that result from your placement of these or other special instructions on your checks. CHECK PROCESSING – We process items mechanically by relying solely on the information encoded in magnetic ink along the bottom of the items. This means that we do not individually examine all of your items to determine if the item is properly completed, signed and endorsed or to determine if it contains any information other than what is encoded in magnetic ink. You agree that we have not failed to exercise ordinary care solely because we use our automated system to process items and do not inspect all items processed in such a manner. Using an automated process helps us keep costs down for you and all account holders. 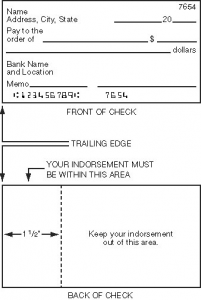 To ensure that your check or share draft is processed without delay, you must endorse it (sign it on the back) in a specific area. Your entire endorsement (whether a signature or a stamp) along with any other endorsement information (e.g. additional endorsements, ID information, driver’s license number, etc.) 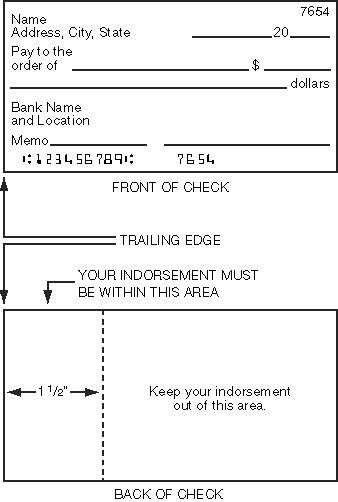 must fall within 11/2” of the “trailing edge” of a check. Endorsements must be made in blue or black ink, so that they are readable. DEATH OR INCOMPETENCE – You agree to notify us promptly if any person with a right to withdraw funds from your account(s) dies or becomes legally incompetent. We may continue to honor your checks, items, and instructions until: (a) we know of your death or incompetence, and (b) we have had a reasonable opportunity to act on that knowledge. You agree that we may pay or certify checks drawn on or before the date of death or legal incompetence for up to ten (10) days after your death or legal incompetence unless ordered to stop payment by someone claiming an interest in the account. FIDUCIARY ACCOUNTS – Accounts may be opened by a person acting in a fiduciary capacity. A fiduciary is someone who is appointed to act on behalf of and for the benefit of another. This account may be opened and maintained by a person or persons named as a trustee under a written trust agreement, or as executors, administrators, or conservators under court orders. You understand that by merely opening such an account, we are not acting in the capacity of a trustee in connection with the trust nor do we undertake any obligation to monitor or enforce the terms of the trust or letters. SECURITY – It is your responsibility to protect the account numbers and electronic access devices (e.g., an ATM card) we provide you for your account(s). Do not discuss, compare, or share information about your account number(s) with anyone unless you are willing to give them full use of your money. An account number can be used by thieves to encode your number on a false demand draft which looks like and functions like an authorized check. If you furnish your access device and grant actual authority to make transfers to another person (a family member or coworker, for example) who then exceeds that authority, you are liable for the transfers unless we have been notified that transfers by that person are no longer authorized. WAIVER OF NOTICES – You waive any notice of non-payment, dishonor or protest regarding any items credited to or charged against your account. ACH AND WIRE TRANSFERS – This agreement is subject to Article 4A of the Uniform Commercial Code – Fund Transfers as adopted in the state in which you have your account with us. If you originate a fund transfer and you identify by name and number a beneficiary financial institution, an intermediary financial institution or a beneficiary, we and every receiving or beneficiary financial institution may rely on the identifying number to make payment. We may rely on the number even if it identifies a financial institution, person or account other than the one named. You agree to be bound by automated clearing house association rules. These rules provide, among other things, that payments made to you, or originated by you, are provisional until final settlement is made through a Federal Reserve Bank or payment is otherwise made as provided in Article 4A-403(a) of the Uniform Commercial Code. If we do not receive such payment, we are entitled to a refund from you in the amount credited to your account and the party originating such payment will not be considered to have paid the amount so credited. If we receive a payment order to credit an account you have with us by wire or ACH, we are not required to give you any notice of the payment order or credit. FICTITIOUS BUSINESS NAME ACCOUNTS – If the name in which the account is held is fictitious, each account holder represents that one or more of the account holders have the right to use that name and have fulfilled all legal requirements for using and or doing business under that name. UNCLAIMED PROPERTY NOTICE – Your property may be transferred to the appropriate state if no activity occurs in the account within the time period specified by state law. Preauthorized credits. If you have arranged to have direct deposits made to your account at least once every 60 days from the same person or company, you can call us at (510) 690-6100, (510) JET-DIAL, or log into Home Banking services to find out whether or not the deposit has been made. For determining the availability of your deposits, every day is a business day, except Saturdays, Sundays, and federal holidays. If you make a deposit before 5:00 P.M. on a business day that we are open, we will consider that day to be the day of your deposit. However, if you make a deposit after 5:00 P.M. or on a day we are not open, we will consider that the deposit was made on the next business day we are open. If you make a deposit at an ATM before midnight 12:00 A.M. on a business day that we are open, we will consider that day to be the day of your deposit. However, if you make a deposit at an ATM after midnight 12:00 A.M. or on a day we are not open, we will consider that the deposit was made on the next business day we are open. You will be paid the disclosed rates until first maturity. Time requirements – Your account will mature ————————————————————————————————————————————– .